Global growth continues, but at a sluggish pace. However one area of the economy that seems to be growing the most is in online shopping. Amazon Inc is a multinational consumer electronics company and the largest Internet company in the United States so far. The company also sells a great deal of other consumer goods including books and video games. Amazon.com operates in three general segments: media, electronics and other merchandise. Amazon.com, Inc. (NASDAQ:AMZN) shares have delivered solid profits to investors over the past year as the 12 month return of AMZN is 66%. And so far in 2016 the stock has advanced 5.4% year to date. Shareholders are pretty happy about this as their investment in Amazon.com appear to be paying off in a big way. In an attempt to capture some of the profits, some of these investors who made big bets on AMZN are selling their shares. For example, Bridgewater Associates, headed by futures trading expert Ray Dalio, sold more than $1.3 billion in Amazon shares recently, which works out to 67% of its holdings three months earlier. Overall more than 10 institutional investors sold off a total of $2 billion of Amazon holdings last quarter. Some analysts believe that future competition will make it more difficult for Amazon to grow its market share so this could be one reason why some investors are getting rid of their AMZN shares while they’re ahead. In the media segment, Amazon competes with auction site eBay, as well as video streaming service Netflix (NFLX.) It also competes with Time Warner Cable (TWX), Google with its Play Store; and Apple (AAPL) with iTunes. Apple is even reportedly working on a new Siri-based assistant service that will go head to head with Amazon’s Echo. Amazon also has several competitors in the electronics and general merchandise segment, many of which are brick and mortar rivals including Best Buy, Staples, Target, Walmart, and Sears. In the electronics and general merchandise segment online competition includes Alibaba Group, LightInTheBox Holding Co., and Overstock.com. One of the biggest gripes experts have against the company is it’s lack of ability to generate cashflow for its shareholders. Rather than return excess profits to shareholders, Amazon.com is choosing to reinvest almost all of its gains. One key indicator to access a stock is the Earnings Per Share (EPS): This is the amount of money each share would be worth if a company were to pay out all of its profits to the shareholders. Amazon.com, Inc. shares have an EPS (trailing 12 months) of $2.43. By taking the EPS we can calculate the Price to earnings (P/E) ratio, which is derived by dividing the current price per share of a company’s stock by its earnings per share. Amazon.com, Inc.’s shares have a P/E ratio of 293 times. This is considered very high for a stock and shows that AMZN is a very overvalued at the moment. However due to the revenue growth of Amazon and its focus on increasing its market share, investors and analysts tend to not evaluate Amazon’s stock price using the traditional P/E method. According to First Call data compiled by Thomson Reuters, out of 40 analysts that cover AMZN, the average 12 month price target from now is $795 per share. Today, AMZN trades at roughly $712 per share, so this data gives us an idea of where the stock might be headed if the the consensus by the equity research firms is correct. 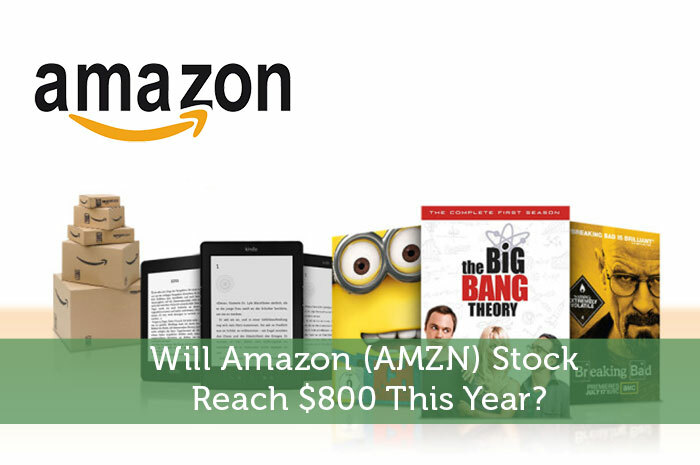 If the analysts are right then there’s even a decent chance than AMZN can reach $800 per share later this year. I think Amazon will run into some tough challenges in the next few years. But with its dominance in North American e-commerce and cloud computing, under the Amazon Web Service banner, the company should be a strong competitor over the long run. As far as technology company goes I would put my money on Amazon to perform well over the next 10 to 20 years than Apple or Microsoft. This author owns 10 shares of AMZN as of writing this article. Will Amazon (AMZN) Stock Reach $800 This Year?